Today I need help from my reader hive mind, because y’all are smarter than me on almost every topic. See, I have a problem with my best girl, Pascale. Ever since moving to California, I’ve had to adjust the dog’s schedule completely. Pascale is the one who’s taken this adjustment the hardest. Previously, she was used to a big backyard that she spent about 1 hour in in the morning unsupervised and another hour or so in the evening when I was home. In addition to this free time (which she would often spend running laps for the happiness of running), I took her to the barn 2-4 days a week where she was never on leash and constantly running/sniffing/interacting with other dogs and people. At the barn, she would happily greet the dogs she knew. With strange dogs, she often would put her hackles up and greet them with a snap or some kind of defensive aggression. I reprimanded her for this, and my approach when a new dog was around the barn was to pet that dog super enthusiastically and literally say out loud to Pascale, Wow! What a nice dog this is! Look at how nice! Okay that’s the background — now here’s my problem in California. Now the dogs’ primary exercise is walking. I walk them 2-3 miles a day, and whenever my schedule allows take Pascale to the athletic field by my apartment to let her run around off leash. I have not taken them to a dog park, because Eliot is flat out dog aggressive and with Pascale’s weird introductions I just described… I’m not sure a crowded dog park with not-so-attentive owners is the best place to set her up for success. Pascale is a good girl and lets me know when she hasn’t gotten enough energy out (like today when I am sick with a cold and haven’t walked her much), but she’s developed a habit on our walks that I’m not happy about. Whenever she sees another dog, she gets super defensive/aggressive on the leash. The problem is worse in our neighborhood than it is when we’re exploring somewhere new, but if a dog on a leash so much as looks at her she will bark aggressively and lunge forward at them with her hackles all the way up. 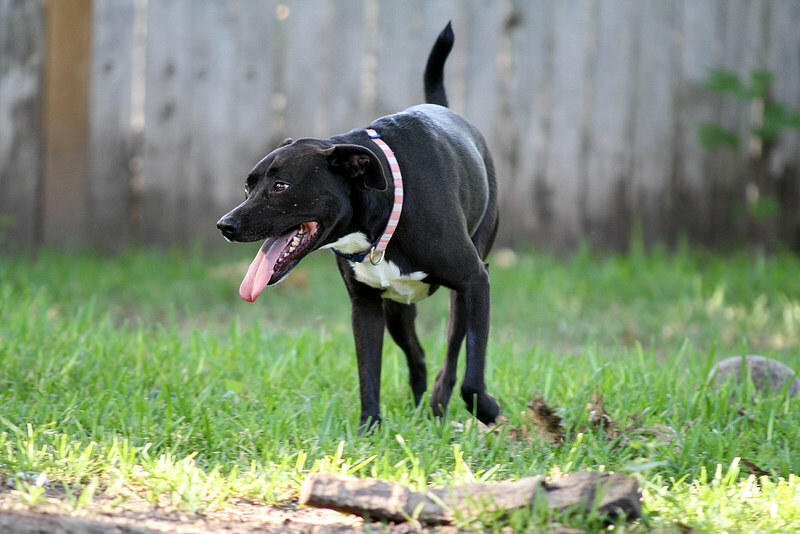 Remember that Pascale is actually really friendly and loves playing with other dogs (once she gets to meet them). Eliot, my truly aggressive dog, happily keeps walking and ignores every dog he sees. He could care less, even though he’s the one who’s going to bite them if they got close and stayed a long time. When Pascale does this, I reprimand her with a “No!” and a jerk on the leash. To try and avoid it when I see a dog coming, I shorten her leash to a proper heel length and continue to try to get her attention on me versus the other dog. It’s rarely successful. She will still get her hackles up, still growl and half the time will bark/lunge at the other dog anyway. This lovely habit also creeps up with bicycles and skateboards passing us. She doesn’t react aggressively to those, but she does lunge/bark at them in some kind of excitement. Her behavior is better towards the end of a long walk when she’s hot & tired, so I’m sure pent-up energy is a bit part of the problem here. But the reality is that I’m doing the best I can. I won’t be able to bring her to the new barn (no barns here seem to allow dogs off leash), and I’m worried about off leash dog parks especially since I can’t even consider bringing Eliot. I know there are a lot of dog folks out there who have extensive training and canine behavior knowledge, and I appreciate any 2 cents y’all can share! I’d hate for this life change and my routines to turn her into a truly dog aggressive dog. Right now, I fear we’re heading that direction. My Plott Hound is very reactive like this, even though she’s actually pretty skittish and would choose to run 9 times out of 10, rather than actually greet another dog. For a while when we first moved here, we could have her on leash in the yard and a dog would walk by and she’d growl and throw herself at the end of the leash. We worked a lot on “look at me” to redirect her attention and she’s gotten really good at it. Now, she’s better about that most days, but when walking, she’s gotten snapped at and has snapped in return when I’ve mistakenly let someone else’s dog say hi, because “oh, they are friendly, can they say hi?” I no longer let this happen at all, and I will stop, ask her to sit and then stand between her and another dog to avoid an unwelcome meet and sniff, whenever a situation arises (like when we hike and the trail is too narrow to truly avoid other dogs). She seems to really like that I do this, she feels safe behind me, and knows I will protect her. 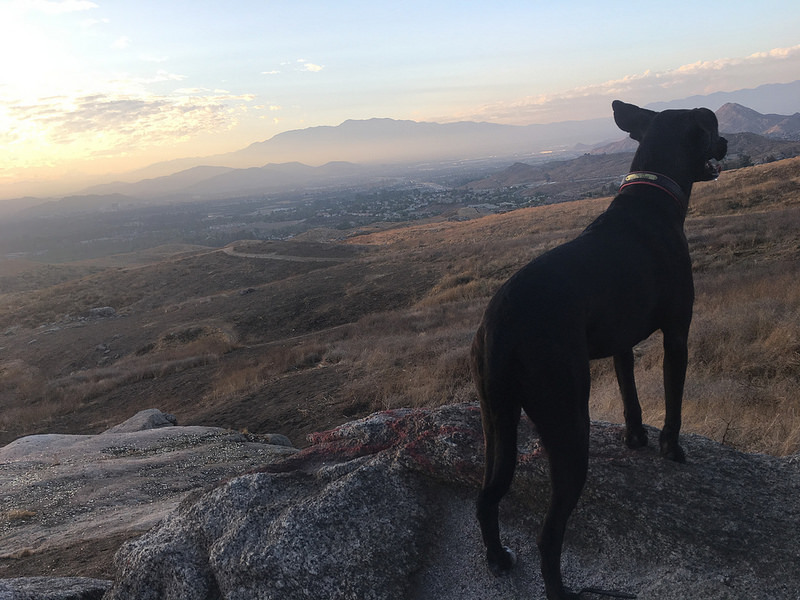 As a result, she is actually pretty confident and outgoing on hikes. When we walk through our neighborhood, I will cross the street to avoid other dogs, or do a quick turn around and head in the other direction trying to keep her attention on me. It doesn’t always work but I keep trying and praise even the slightest glance at me until I get her full attention back. Also, 1 thing I found that really helps with her energy level (no fenced yard for us right now, either and she’s definitely hyperactive for a bit and then total couch potato) is the addition of a doggie backpack to our walks/hikes. I will put 2 water bottles in either side of it, so it gets lighter as she gets tired (because she or I, or both, are drinking as we go) and she also gets to carry her own poop bags, etc. It gives her a job that she takes VERY seriously, weighs her down a bit, AND, has the added benefit of people thinking she’s a working dog, so MOST will actually go out of their way to avoid her. I actually own a dog backpack so I should totally get that out! If nothing else, she can carry her toys to the athletic field in the afternoon for play time. You can also do a bag of rice in each side. I used to do that with my border collie-pibble mix. It definitely helped. What brand/style dog backpack do you recommend? Seconding the backpack idea – as long as you’ve got one that fits! (An awful lot of packs are WAY too big for the girth measurements they fit- and it’s fine if you’re filling them up with light-but-bulky stuf (ie, a sleeping pad) but if you are using weight for training, it’ll bounce around and end up fruther back on the spine and not over the shoulders, or come too far down and interfere with the elbows. I got this one, great reviews and I love it (so does Jazzy!). Hard to know exactly what the issue is without seeing it, but the way you describe things it sounds like Pascale is kind of insecure. That can make a dog lash out at others when on leash, because they feel kinda trapped, especially if they meet dogs that react poorly to them (super common in my area). My Lyra can act this way a lot. What helps in that situation is teaching them to look to you for guidance in such situations. Get their attention in positive ways (put her through her tricks and reward her for listening, don’t use treats only to try to wean her attention away– this isn’t effective long term). It also can help to put them on the opposite side of you, so you are a barrier between the other dogs and them. It’s a long process, but it’s doable. And you have another dog to help show her the way, which is helpful. For exercise, have you considered getting a bike attachment and running her alongside your bike? The back wheel ones are pretty great from a safety standpoint. Honestly I’ve wondered about the safety with the bike attachments, probably because I used to just hold a leash with my labrador when I was a dumb kid and have never done it properly. That’s a great idea though to get a little bit of extra energy off of her, because she could certainly use it. I think I need to try the treat/reward process instead of the reprimanding one. She’s SUPER food motivated and I agree with you that she’s pretty insecure. I have a very dog-reactive dog and he’s a miserable walker if he’s under-exercised. If you can get him going fast enough, his brain can’t process other dogs near us. Once he’s tired, he’s definitely easier to deal with around other dogs. I still can’t take him to parks, and he doesn’t have any friends other than his brother, but man, the biking helps. I feel like… redirecting? Like get her to focus on you instead of the other dog and reward her when she does, until you’re able to pass another dog with her ignoring it. More steps between A & B, but google is probably a better teacher than me. This. Be the automated treat machine. And use a word like ‘watch’ which means you have direct eye contact with her eyes. And treat it when you get it (work on this at home). Use watch and start training other tricks you can use BEFORE the thing she will react to can be noticed. And even for things she might be ok with, but that so she always, eventually looks to you. In the meantime, have as much isolated on leash walk time as you can to minimize interactions. Yes! My big goal with Jazzy was to always have her look to me or come back to me when she was unsure of something. When she gets to the end of the leash (whether training length or regular), I want her to come back and check in. She sees something spooky, I want her to look at me for reassurance. It really does work! It is very common for dogs to become more agressive when they on leash because of feeling insecure/unable to get away, which comes out as aggression. Austen had some good suggestions. My dogs are better just by me putting myself between them and the scary/strange thing. Another thing to try: You will need to walk her by herself. When you see something coming, before she becomes reactive, get her attention and practice sitting or other commands she is familiar with and give her treats for paying attention to you and ignoring the passing dog/bike/etc. Continue until the distration has passed. Start with things she is already less reactive to, so she learns the rountine. If you can get a friend with a strange dog to help, you can specifically start with low stimulation (dog passes far away) and over time work up to the dog passing by closely. Eventually you can wean the treats away, but I wouldn’t hesitate to use them in the beginning (not as a lure, but as a reward for performing the behavior you ask for). Yes, I can be this friend with the strange dog! A solid “watch me” so she pays attention to you is the best thing to teach. A “leave it” is the next step. Start at home then work on the porch/somewhere safe and reinforce with very good cookies when she reacts properly. dragonflyllama.com is Sue Ailsby’s site and she has very good step by steps on a lot of behaviors. Zen and loose leash walking wouild be the ones you’re looking for. Also, the shortening of the leash could be sending her the message “momma is tense, you should be to” and fueling the reaction. Maybe working on long leash to short leash transitions (like you would free walk to working walk under saddle) could help teach her that short leash just means focus not that bad things are coming. Yes, I meant to mention this, too! I try to make a conscious effort to not shorten the leash or tighten my grip on it when I see another dog. I just say,”Let’s go!” and cross the street. Yes! I was going to comment on this too. It’s the exact same thing to the dog as squeezing your fingers on the reins while riding: the dog feels that tension the same way a horse would. Yes – I was also going to mention that you may be signalling apprehension through the leash when you shorten it. You guys have moved to a new place and Pascale may be feeling a bit more protective anyway. It’s kind of like letting go of your horse’s face when they’re acting tense – seems counter-intuitive but it’s the right answer. This is Finn to a t because he’s afraid of literally everything. (Case in point, right now the dog food container is HORRIFYING because it moved 20 feet.) I’ve had really good luck with clicker training a ‘look!’ command and getting him to focus on me. Bikes have been the easiest, dogs are getting easier, motorcycles may never be okay in his world. He also can’t be off leash (thanks JRT brain) unless totally fenced in, so while we get outside a fair amount, I also went ahead and bought him some puzzles and games. While not physically exhausting, it definitely helps his little brain work. Reef is the same. We went through this exact thing, and yes, it does boil down to excess energy. It’s a constant battle keeping him tired enough. We worked with a great trainer that gave us some tools to help him. Also worth noting: he has always been great at dog parks, even when he was super leash reactive. It’s the leash. And the excess energy. We ended up putting him in a gentle leader for our walks, which is basically and hackamore. He can’t get leverage to pull against it. So when we see a dog, we ask for a sit, using pressure on the gentle leader to get/demand his attention. Then he sits and gets stuffed with treats while the dog walks by on the other side of the street. It took a lot of practice and commitment, and time, but he’s much better now. He will still whimper and whine when he sees some dogs, and there are 2 poodles in our neighborhood he hates with a firery passion and when they walk by, I’m lucky to get him to sit. The “look” command is a great tool, also. End note: do not lose hope. It will take some time and a lot of work, but you can work through it. And you’ll figure out a new schedule that works for Pascal. We could just have monthly playdates…honestly, I’d be happy to bring Reef up your way to help demo some of this stuff. I was just going to recommend texting with Carey because she has run into some similar issues with Reefly! Another vote for biking with Pascale. We have never had a fenced in area for Jersey (we live in a townhouse) so I taught him early on to run next to a bike. I don’t have any bike attachment, I just hold his leash. My biggest worry when biking is being attacked by a loose dog (thankfully has never happened), but I would want to be able to drop the leash so he could get away. He’s a greyhound, and his speed is his best defense. I don’t think I would bike with a dog that lunges on her lead. I see a lot of crashing in that future. Biking is only safe if your dog is perfectly behaved on the leash. Always. Perhaps this could be a goal. Arya can get like this; it’s not aggression in her case, just extreme excitement. But that’s tough to explain to someone else when she is hitting the end of the leash yowling at the top of her lungs. I agree with the others that it’s an insecurity issue. In that case, reprimanding actually ends up being counter-productive. She’s communicating her insecurity to you, and punishing her for that doesn’t process that nervousness. With Arya, we have a two-part strategy. If I see a dog coming before she does, I do shorten the leash a bit – not to tighten it, but to give us a closer radius to work in. I do a firm “let’s go!” to get her attention on me and to keep her moving along. If I act like we’re moving forward with excitement her attention shifts from the dog to me and what’s out in front of us and what we could be doing next. This can be near-constant “let’s go!” cheerfully, I might walk a bit faster, I might put a treat in one hand and have her nose on my hand while we’re doing it. Or it can just be a reminder once or twice as we move along. I try to read her body language, gauge how she’s been on the rest of the walk. If she’s actively flipping out over another dog, I get her focus back. The groundwork for that needs to be laid outside of walks, too. We installed “touch,” to get her to tap our hands with her nose, early on, and reinforce that frequently. So if she sees something on a walk that gets her attention in a negative way (people, squirrels, other dogs, you name it), I refocus her on me. It may take a few times, and a bunch of treats, because she may go right back to focusing on the other dog, but once you have and keep her attention you can re-start motion. You can also “cheat” by doing an easy touch, putting your hand right near her nose so she bumps into it, and then praising for that. It can help to prime the pump early in a walk by doing easy touches when she’s not distracted at all, so if something does come up, she’s got the habit in very recent memory. It’s actually a lot like handling a spooky horse. You give them tasks to do, keep their focus on you and not the environment, and in doing so instill confidence in them. I’ll echo the “look” or name game (teach her to look at you and come to attention when you say her name) comments. Our shorthairs are high energy and like to fixate on things (hunting dog, much?) and they wear pinch collars – partially because that’s what the obedience schools want them in (they legit hang themselves with a regular choke chain) and partially because the prongs keep them in the correct stratosphere and bring them back to attention. I can do a quick pop and say their name or “Name, LOOK!” and get them back to focusing on me. A gentle leader also seems to really help other people feel better, because they look like the dog’s face is more under your control even if its totally in their heads. When I take my younger/unconfirmed in obedience dog out to places, I carry treats in my stupid waist pouch thing and are set up with the collar/leash/treats we use at class so he’s more likely to know what I’m asking when I start asking him to “work” like he does at class. I agree with everyone’s comments about the “watch me” “look at me” and redirecting her to you rather than the dog. Have you considered a gentle leader? They can really help with controlling your dog- you control the face, and she has to pay attention to you. We use them at the shelter all the time. One other thing I would suggest is to never punish a growl or bark. So, saying “NO!” and yanking her is teaching her not to bark or gorwl. But the problem is, what comes after a growl or bark if the stimulation is still there- a bite. So, she may stop barking and growling, because she knows she will get in trouble for it, and goes directly to snapping or biting. You’re on the right track though! Lots of treats and redirection should be the key for the behavior. And I LOVE enrichment toys. I have a VERY high energy dog and on days when she can’t get enough exercise I give her a frozen kong or some sort of enrichment toy just so she has something to do! Feeding the whole dinner as training treats throughout the day can work to. Exhaust the breeding and the body will follow. As a dog-behavior-professional, I essentially do variations of that with clients who have reactive dogs. A front-clip harness (like Freedom Harness brand – but don’t buy their stupid leash) can be a good tool to give an advantage with leverage. I bike my Doberman on a leash with elastic in it. It expands from 4ft to 6ft. It gives me enough leeway if he jerks. Biking literally solved all his problems as a young dog. Of course as a young dog he needed 3-5 miles daily at a pretty good clip. You probably won’t need that much..Think medium trot. I also ran him at night or early morning. If he started to get distracted then I ran him faster. Also the look at me command and the leave it commands work wonders. Sometimes it’s hard for spazzy dogs to focus. The dobie wears a REI brand backpack. The most important feature is the Y attachment in the front. Like a breast collar. Prevents it from listing to the side. I would also start indoor games too. Puzzle toys and nose work is pretty fun. Using the brain can tire them out pretty good too. There is tons of great advice here. I am not a dog person, but if I look at from a horse owner’s point of view I would say check the diet and increase socialization and turnout. Her lifestyle requires less energy now, could you adjust her caloric intake? Is there a time each day when she could have an extra walk without Elliot? 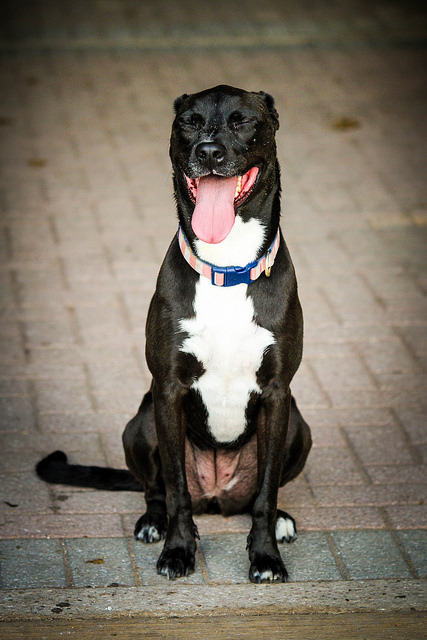 You could give her extra attention, more exercise, and perhaps find a doggie friend for her to play with? You said that she loves playing with others, but she is not getting that outlet now. Off-lease time is another loss for her. All those smells and exploring. That is a tough one to replace. Maybe a meandering walk to a new location. I know that is not easy to keep up either. I am not a dog trainer nor do I play one on TV. I have a 9 month old GSD who is super sweet about everything but other dogs when we are walking. Even though I did puppy class and obedience. I just finished an urban dog class that was all about walking in public and passing dogs. It is still a work in progress. For him treats are useless because when he’s excited he just doesn’t care. But he does love his toys. Anyway here’s what is helping us- one is to not allow him to make eye contact with another dog. Given his breeding he’s likely to react to a ‘challenge’. It can look quite comical with me trying to break eye contact and him trying to look around me. I am working on the ‘watch’ command and it works well, unless he’s really focussed. On the advice of the instructor I’m trying to teach him to come between my legs and sit. She says that this has the advantage of giving me leverage and helps him to feel more secure. That I haven’t tried out of the yard yet because we’re still working on it at home. You definitely have a lot of good advice here. Totally agree that a tired dog is a happy dog. I’ve got a Llewellin Setter than requires a TON of exercise and it’s a battle sometimes when I’m sick or it’s rainy. I agree that trying a bike would be good. My Emma is a lot more focused on just going forward while we run than when we’re walking. I’ve also trained her to “heel” on and off leash so that when I say that she comes right next to me with no leash pulling. She has similar issues meeting leashed dogs (she got bitten by one once) but no issue if she doesn’t feel the leash pressure. I started her training in the house–just 5-10 minutes before her dinner every day and slowly increased the time and distance and moved it outside. Just like with horses, it’s all about consistency. Now my pup and I run off leash every day and I can call her to “heel” whenever we approach another human or dog. I have the same problem with Fred who is also very reactive to other dogs, people, bikes, just about everything. First of all, it’s not an easy or quick fix so make sure to mentally prepare yourself for that and try to not get frustrated (so much easier said than done in my case). Also be prepared to look like a crazy person at times. I’ve only briefly looked through everyone’s advice above, but most of what I was seeing was really good suggestions. What I haven’t seen mentioned, and is super important, is the threshold concept. The threshold is where you dog goes from relaxed to alert to tense. You need to keep your dog under the tension threshold because once they cross that you won’t be able to get them to focus on you. If you are going to train a horse to accept clippers, you wouldn’t just start by trying to clip their ears right? For Fred his initial threshold was about anyone he could see in a mile, so I literally would sit with him at the end of a huge parking lot and work on rewarding calm and rewarding looking at stimuli and staying calm. From there we slowly moved closer. On walks, if I see another dog approaching I will usually turn around, cross the street, or something similar to put more distance between us. My favorite dog training book is one called “Control Unleashed” by Leslie McDevitt. It was pretty life changing for Fred. Prior to reading that book I would try to hold Fred’s attention by asking him to “watch me” to keep his attention on me and off of what was scary. That is pretty hard for him to do in certain situations and is really more just a band-aide- he’s still scared of what it is he’s not looking at, and knows that it’s there. 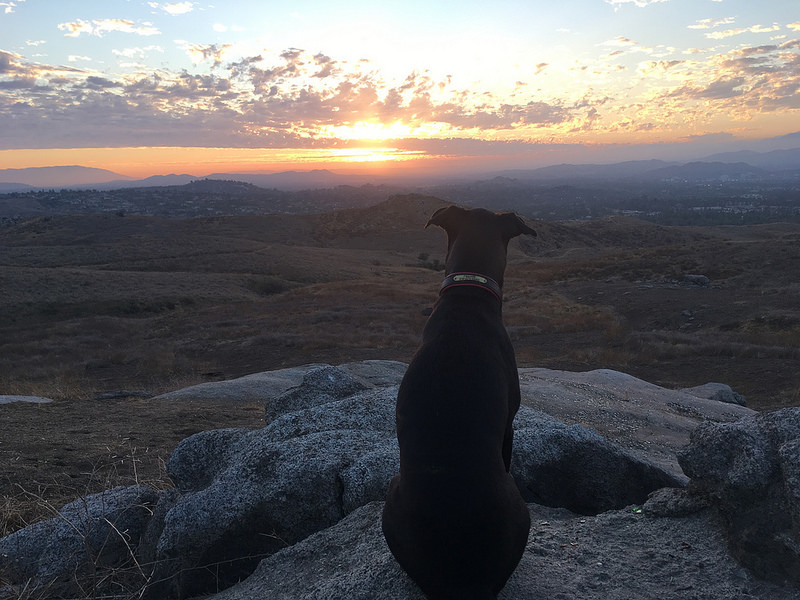 What Control Unleashed will teach you to do is instead train your dog to “look at that”. You train your dog that he’s allowed to look at what scares him, and when he stays calm and looks back at you he gets a treat. Fred is allowed to glance at the scary people or dog as much as he wants as long as he stays calm, and eventually they spend less time glancing and more time paying attention to you, and it’s 100% their choice and not because you told them to watch you. It’s a super cool book and training ideas. I would highly recommend trying to find a positive reinforcement class for reactive dogs (not a normal dog training class) or hire a private dog trainer to come work with you guys a couple times at your house. Dog training sounds easy on paper but it’s like riding- you can read a dressage book and be like, “yeah I get it” but of course the second you try something new you aren’t going to have the timing totally perfect or always know how to react in certain situations. It’s super helpful to have a professional work with you at least initially because the timing is SO critical. If you need advice on finding a good dog trainer let me know! Sounds like a great read! Adding it to my Christmas list! You’ve gotten lots of great advice already, from much more experienced people than I! Kona isn’t aggressive, but on the leash she is much more timid and nervous than off leash. Positive rewards for looking to me for guidance has worked well, as has putting myself in between her and whatever she’s upset about. I’m the mean one who uses a shock collar. It is a really light shock or vibrate, only had to use it a couple of times and now I just have to “beep” to get the houligans attention. Might be a last resort but it worked for me with my dogs who go crazy barking like mad when it’s time to go outside. I paid $25 cnd for a Chinese model on eBay and it works amazing. I second talking to Carey. I took a class titled Control Unleashed based on the principles in the book by the same name. I can loan it to you. But it’s all about making you the focus and having high value treats (think hotdogs in tiny pieces) and basically not allowing her the opportunity to even focus for more than a 1/2 second on the potential distraction/object of aggression. Buy Control Unleashed, by Leslie McDevitt. It’ll change your life. Glad to see other people love that book too! That book and learning the idea of rewarding my dog for doing nothing (because that is the behavior I want when he hears or sees another dog). It made such a huge difference for us! as for lead walks..minimal and avoidance of dogs for that..be kind to her.that is obviously worrying and frustrating for her. let her enjoy running free on occasions. i don’t agree with getting between dogs and getting angry at other owners just because their dogs are fine, many a dog fight starts when a clueless owner pull the leash back and physically interferes during a greeting in any way..immediate aggression ensues. be confident, and trust pascale.